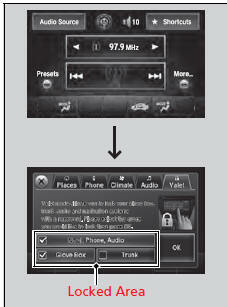 You can lock the glove box, trunk, and/or navigation*/audio system, entering a PIN code from the On Demand Multi-Use DisplayTM. To lock: 1. Select Shortcuts. 3. Select the item you want to be PINprotected from the locked area, then select OK.
4. The previous code is displayed. Select OK.
- You will receive a confirmation message on the display. Select OK. When you enter the PIN code for the first time or if you want to change the code: 1. Select Shortcuts. 3. Select the item you want to be PIN-protected from the locked area, then select OK.
4. Enter your selected four-digit PIN code, then select OK.
5. You will be asked to enter the same fourdigit PIN code again. Enter, then select OK.
3. Enter the four-digit PIN code you have previously selected, then select OK.
• The trunk release button on the driver's door, on the trunk, or on the remote While the glove box or the trunk is PIN-protected. If you have locked all the items of the locked area, the PIN code entering screen appears with the power mode in ACCESSORY. You can cancel the valet mode when you manually open the trunk. 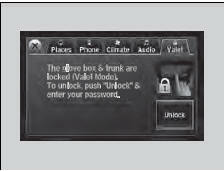 If you have only set Navi, Phone, Audio PIN-protected but forgot your four-digit PIN code, you need to go to a dealer to have the set valet mode reset.